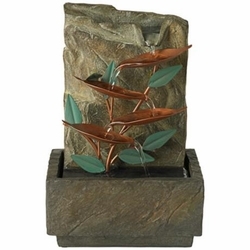 Indoor tabletop fountains are an easy way to bring a calming water feature into your home. This design features a handsome base of lightweight realistic faux stone with a natural texture. A stylized metal bird of paradise flower hugs the stone, receiving water into its copper finish blossoms from above. Includes power cord. • Small indoor tabletop fountain. • Lightweight stone finish polyresin. • Blue and copper finish metal. • Includes pump and 6' cord..